I belong to a small group of quilters known as the Fyber Gypsies (made up of members of the Rocky Mountain Creative Quilters guild) and this spring we set ourselves a challenge: we picked two crayons from a paper bag and one word from a bunch of slips. The goal was to make a quilt using those colors and to look to the word for further inspiration. I got pink and black crayons, colors I rarely use, and my word was “embellish”. 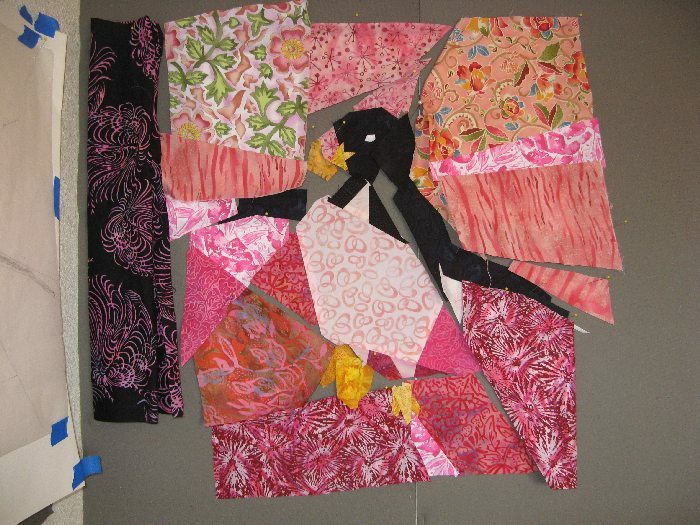 As with most quilts, my initial ideas were very different from the final product. 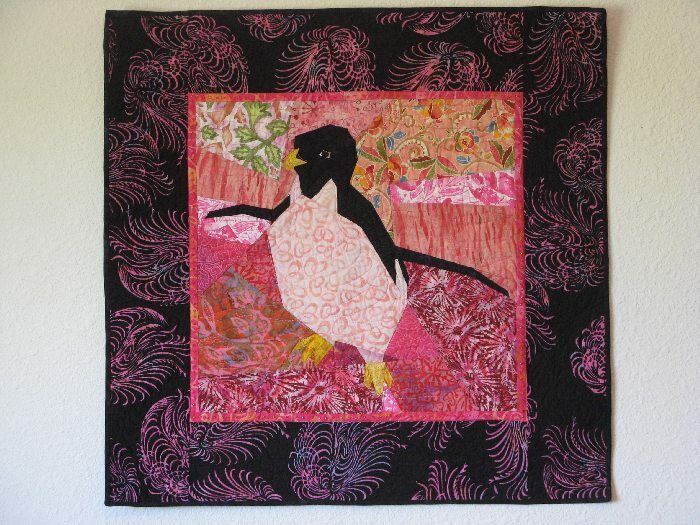 At first, I though of making animals that were either pink or black and then adding an embellishment-worthy accessory in the opposite color, such as a pink pig in a black top hat or a penguin in a tutu. The animals would be cute, simplified shapes, and the overall effect would be whimsical. I would make four separate blocks, each with a different animal on it. Once I started sketching, the plan changed completely. 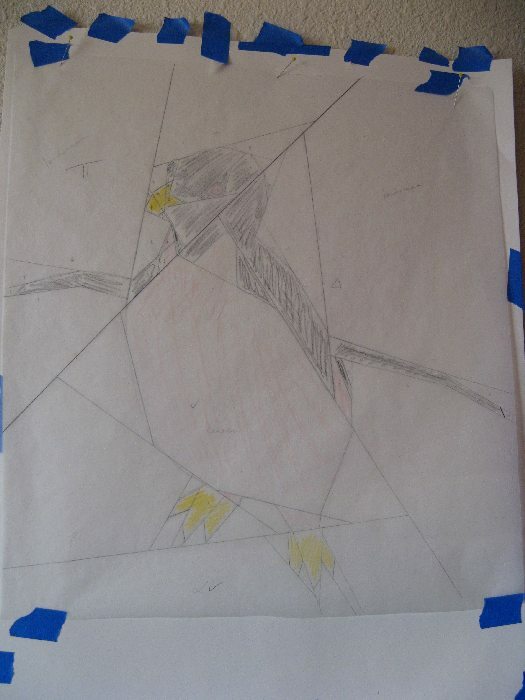 I found some Adélie penguin pictures (a very cute, round penguin species) and made some drawings, thinking that I would like to try using the piecing techniques I learned from Ruth McDowell in a class I took with her over 10 years ago. 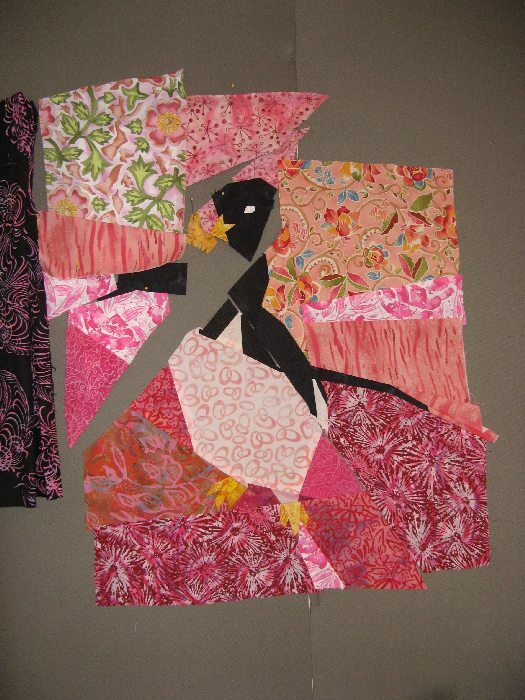 But I had to enlarge my penguin to about one foot tall so that the smallest pattern pieces wouldn’t be too hard to work with, and I needed the finished quilt to be a manageable size if I was going to meet the deadline we’d set for ourselves. So I went from four animals to one. My pattern has turned the original drawing into straight lines, but you should be able to tell that the drawing I came up with was rather realistic. 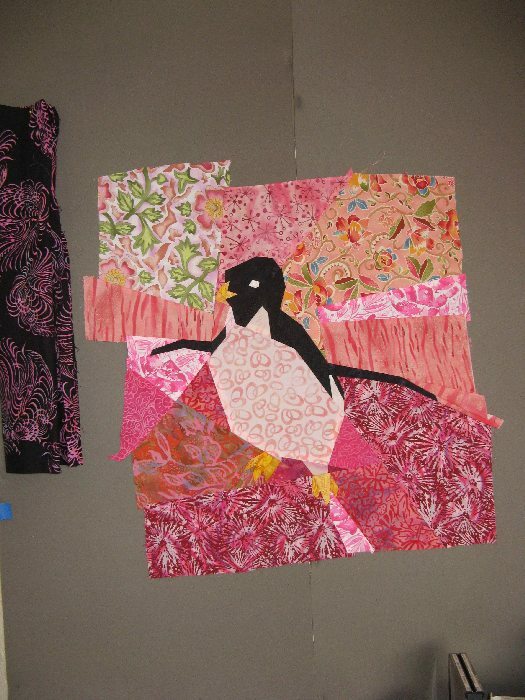 My tutu idea no longer worked, so I decided to use pink fabrics for the white I would need for the penguin and the snow/ice behind him in order to meet the color requirements of the challenge. I auditioned fabrics and started putting the quilt together. Fabrics selected and ironed onto my pattern pieces, and construction has begun. Motion and depth, very nice work. Just checking in! My daughter, Oni, is obsessed with penguins! We love it! Not a stitch going on over here….yet!